This is Part 2 of our tutorial series on building a membership site with WordPress. In Part 1, we provided an overview of what membership sites are and the benefits of starting your own membership site. In this tutorial, we look at planning and researching what the focus of your membership site will be and the audience you will be targeting. Before you begin building your membership site, you first need to determine what the overall focus of your site will be. What will your membership site be about? There are literally hundreds of membership topics to choose from. You can build a membership site based on your own experience and skills or your personal interest or passions, but you also need to ensure that the topic you are considering for your membership site is something that people are willing to pay for. Ideally, you will choose a membership topic that not only excites and interest you, but that also has a crowd of hungry people (i.e. a demand) and overall profitability. Evaluating current demand for potential topics. Evaluating existing products for potential topics. Evaluating current competition for potential topics. You want to make sure that there is an existing customer base for your membership topic. You want to build a membership website around a topic that is scalable, so that you can create additional products, services and upgrades later on, consistently working towards extending your sales funnel. You want to make sure that the market you are considering isn’t extremely competitive, or difficult to penetrate. In order to quickly determine what topics are likely to be strong ones worth building a membership website around, it’s important to conduct niche research. When it comes to choosing a niche market for a membership site, we recommend avoiding micro niche topics where the size of your market is not sufficiently large enough to build a community (and a profitable membership site) around. When you create a membership site, you have a primary product or package. This is ultimately what entices potential subscribers to join your site. With membership sites, however, you need to update them on a regular basis to keep them interested in returning. If you choose a niche market that is too small, it will be difficult to come up with ongoing content for that community. This means that your topic should be completely scalable. You need to be able to develop alternative content, additional modules and ongoing content packages that will sustain your membership community and keep people subscribed. What you need to do, then, is find a balance, where you can focus on a larger market that isn’t overly competitive. While the existence of competitors within a market often symbolizes just how profitable that market is, you still need to be able to break into the market and create sustainable growth. Ideally, you will want not just a hungry market, but also one filled with what some expert marketers call “irrationally exuberant” people. People who are so fanatical about your niche that they will open their wallets and buy just about anything that promises to feed their insatiable passion for that subject. The ability to compete successfully in a competitive market. What can you create that is unique to the market and isn’t already being offered? How can you take existing content or information and re-create an improved version that people will want to buy? What other forms of content or material can you create other than what is already being offered as a standard in that particular industry? You can definitely make money in competitive niches, as long as you have the ability to create unique material (or present it in a unique way) to help position your membership site so that it will stand out to people who are interested in your topic. This isn’t always the easiest thing to do, especially if you are on a limited budget and unable to outsource the majority of your content creation. You want to be realistic, therefore, with what your overall objectives will be. While you may be able to envision a bustling membership website in the weight loss industry, if you are competing directly with Weight Watchers, you could find yourself on a sinking canoe without paddles, trying to race against a powerful ocean liner. By all means go after profitable markets, but make sure that you also have something unique, and of high value to offer. If you don’t have an idea for a membership site in mind yet, then write down a few topic ideas that you can evaluate further. Consider topics that you have a personal interest in. While you will need to make sure that they are profitable markets, starting with your interests and passions is a great place to begin when brainstorming for ideas. Are you experienced with a specific skill, hobby, interest, or training of some kind? You don’t have to be an expert on a specific topic in order to create a successful membership site. You simply need to pinpoint potential ideas that are worth investigating further. Using your own personal interests as the foundation of your market research is simply an easy way to get started, but you could also include a combination of topics that you believe are profitable and pursue those regardless of whether you have a personal interest or investment in those areas or not. Consider hungry markets and desperate buyers as well. What problems do people have that they are desperate to find answers or a solution to? Desperate buyers are people who are often willing to pay for an immediate solution to a problem. These are people who don’t just want something … they NEED it! For example, some acne sufferers belong to the “desperate” buyers group, as do people suffering from obesity, low self-esteem, and people looking to save their marriage. The more desperate your market is, the easier it will be to create specific products catering to the things that are specifically important to them. Many businesses have become successful simply by connecting desperate buyers with products that solve, reduce, relieve or eliminate their problem. Hungry markets tend to combine both desperate buyers and regular buyers in the same group. For example, a membership site focusing on ‘How to make money from home’ could encompass both desperate buyers who need to find an alternative method to generate additional income or find a new job, to hungry buyers who have a current job but are interested in upgrading their lifestyle, or in making the transition from employee to self-employed. Write down your ideas. Even better, start a “membership” ideas folder, so that you have a number of great possibilities to work with and develop further. Need Help Coming Up With Membership Site Ideas? The price of competing membership sites. Communication channels and delivery options. Since you will be competing with the merchants that you are evaluating, it’s important to determine the going price for membership sites in each market. You will want to set your price structure so that it’s competitively priced, especially when initially launching your website and attempting to attract interest. You will also want to survey existing products, including how much content a typical membership site in your potential markets are offering, as well as how they are delivering the goods to their customer. What membership scripts are they using? How are they communicating with their subscribers? (Forums, chat, weekly webinars, etc). The more information you can compile based on each topic, the easier it will be to determine whether you feel you are able to compete with existing communities in each niche. Keep a rolling swipe file of all of the information you collect, so you can quickly evaluate it later on. Conducting niche research is simple, but can take a bit of time. It’s a very important part of the process when assessing profitability and focusing on building membership sites that are likely going to be worth the time and effort you put into developing them. Search digital marketplaces, including ClickBank, JVZoo.com, PayDotCom, etc. when researching competing or existing membership sites. Compile enough information to be able to get a clear idea as to the overall competition of a market, but more importantly, the quality of existing membership sites out there. Apart from evaluating products and membership sites from existing marketplaces, you can also do additional research by checking out what people are talking about in related forums, communities, and social networks. Use free services like Google Trends, Yahoo News and Yahoo Answers to keep on top of potential markets and determine not only the level of competition in the market but also what customers are asking for, looking for and currently interested in. Google Trends lets you receive instant alerts each time a specific keyword or keyword phrase appears within the Google search engine. Yahoo News has a “Trending Now” section that makes it easy to stay on top of trends and hot topics. This provides a great way to investigate possible topics for membership websites. Yahoo Answers is a goldmine of membership website ideas. Yahoo Answers is a community where people can ask questions and others can answer them, earning points along the way. Just by browsing through categories and reading over the latest questions, you will be able to compile a list of possible membership topics, quickly and easily. Forums are a fantastic way to evaluate overall interest and be able to pin down specific types of products that you could consider making available for your own membership site. Browse through existing threads and categories on relevant community boards and keep a pulse on what is being discussed and what people are actively looking to purchase. 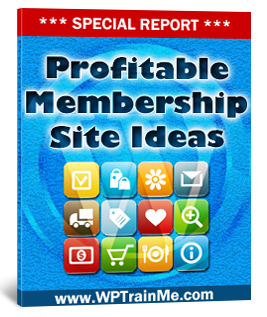 This is a goldmine when creating a potential blueprint for your own membership site. Once you have a list of potential ideas for viable membership sites, the next step is to take each idea and run it through certain “filters” to determine the overall profitability of each idea. Survey existing products in the niche. Evaluate the size of the market. Identify gaps in the market that you can fill. Again, market research is a significant factor in determining the quality of the above information, so don’t skip this important step. In our next tutorial, we look at different types of membership platforms that will suit your membership model and help you deliver your products or services.